Trident provides high quality shellfish products. Harvested in an ecologically and mindful manner, Trident leads the Alaska industry in production of crab, canned sockeye salmon, and frozen Bristol Bay sockeye. What started with “one boat,” Trident grew to be among the state’s top producers of Pollock, cod, herring, and canned pink salmon. At Trident Seafoods we are committed to providing delicious, convenient, easy-to-prepare menu items that celebrate the best the ocean has to offer. By harvesting the vast majority of the seafood we sell and crafting an expanding range of premium quality products, we provide unmatched value to our customers and help fuel the success of their businesses. Trident Seafoods’ all new Redi Grilled wild salmon portions are fully cooked and Recipe Redi™ for heart-healthy salads, tasty teriyakis, signature sandwiches and a host of delicious seafood entrees. Cut from 100% wild Alaskan salmon fillets, these fire grilled four ounce portions are ready to thaw and serve — or simply warm them up in your favorite salmon recipe. 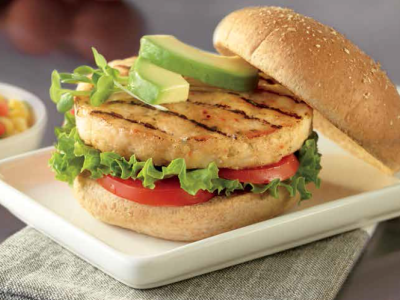 Made from wild caught Alaska Pollock and individually quick-frozen to lock in freshness, our whitefish burgers cook up quickly and easily, right from frozen. They are seasoned with a flavorful herb blend to enhance the taste of mild whitefish while leaving your menu options wide open. 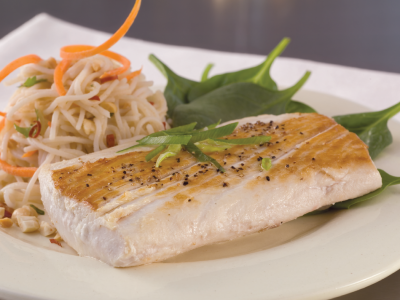 Longline caught from the blue waters of the South Pacific, Trident Mahi Mahi brings the tropics directly to your menu. Each fish portion is vacuum packed and frozen at the very peak of freshness, so you can be assured it’s the highest quality available. Mahi Mahi is a colorful, exotic fish that yields delicate, light pink fillets with a sweet, mild flavor and large flake. When cooked, the portions turn a beautiful ivory-white, making a very attractive dish when plated.